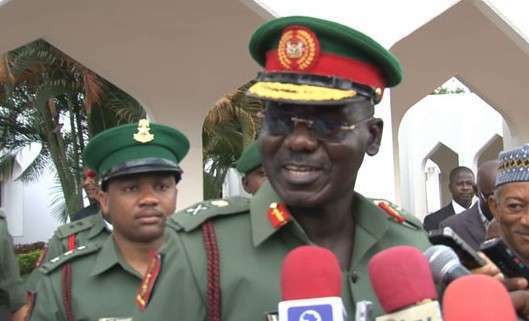 The Chief of Army Staff, Tukur Buratai, has said that the Nigerian Army would be raising up cattle ranches in almost all the divisions and brigades. Mr. Buratai, who was represented by the Chief of Army Logistics, Patrick Akem, said this on Tuesday at the Commissioning of Mogadishu Cantonment New Mammy Market (former Abacha Barracks), Abuja. The Army Chief said in keeping up with modern cattle rearing tradition, he sent officers to Argentina to look at how cattle were reared. “To take it to the next level, we want to adopt a system where the cattle are not just free ranging coming from Sokoto to Port Harcourt, thereby making their meat tough to eat, the products will soon be coming from our own farms and ranches,” he said. He said he created the Barrack Investment Initiative as a platform that affords Army family members the opportunity of raising up fishing ponds, vegetable gardens, fruits, livestock, chicken and their eggs. He added: “We want to tell our wives that they can live beyond the salaries of their husbands, so we are trying to empower the women in the barracks to be able to form co-operatives, so as to access loans and to a large extent be able to fend for themselves and their families, even without the salaries of their husbands. Meanwhile, the Commander Army Headquarters Garrison, John Malu, said the shopping edifice had over 2000 shops, 27 warehouses and a printing press owned by the Nigerian Navy. THE BIAFRANS ARE NOW VINDICATED.BURATAI'S STATEMENT HAS BEEN THE AGENDA OF BOKOHARAM,FULANI HERDSMEN LEADER,(MBUHARI)AGENDA TO USE ZOO ARMY AND DSS DISGUISING AS HERDSMEN TO ATTACK OTHER PARTS OF NIGERIA. DSS UNDER DAURA HAS BEEN THE CO-ORDINATOR OF VARIOUS ATTACKS SO FAR WHILE MBUHARI PUSHING SAME THROUGH THE NATIONAL ASSEMBLY.THEY HAVE FAILED AND FAILED FOREVER. THEREFORE,IT IS TIME TO STAMP OUT THIS ANIMAL.ANARCHIST AND JIHADIST MBUHARI AND GO ON TO FACE ACTIONS WITH NOW ISLAMIC ARMY UNDER BURATAI AND MBUHARI. THE TIME FOR ZION-ARMY TO PRACTICALLY ELIMINATE THIS WAHABI-SAUDI TERRORIST CALLED MBUHARI AND SMARSH HIS ARMY WITH ZION ARMY.IT IS TIME TO BEGIN A LOW UPRISING TO DESTROY THIS ZOO.YES,WE CAN AS ONLY THE ZION ARMY THAT CAN CRUSH BOTH ISLAMIC ARMY UNDER MBUHARI AND OVERFLOW IS NOW.THE ONLY MEANS TO END TERRORISM BEFORE FREEDOM IS TOTAL ELIMINATION/CUTOFF THE HEAD OF TERRORS. TIME IS NOW TO SET ZOO ABLAZE,YES,WE CAN TO THE GLORY OF GOD OF ABRAHAM,ISAAC AND JACOB.BIAFRA RISING!ISRAEL RISING!! OGE AKARAKA ERUO. URS THE BIAFRAN RABBI. These Fulani's are the most crazy bunch of idiots you can imagin. People grabbing resources that does'nt belong to them. These cattle rearers are private interprises but they want to shamelessly steal other peoples land and give to them. Having a fulani herdsmen around you is potentialially having a killer in your neighbourhood. They've got this gut because they have been stealing other peoples oil for decades without hinderance. These are babarians of the highest order. People without conscience. Perharps thats the main reason the sarduana of Sokoto is in Nsukka.People should wake up from slumber. This must be the main reason Buhari made several attemps to rule Nigeria again. Why cant they graze in their massive region made up of grasland which is suitable for grazing. I wonder ooo!Please tell them....These people paa!In this era? It no go work! Nigeria is truly a ZOO. I cannot believe that Nigerian soldiers will now be engaged in cattle rearing all over the federation. This is sad indeed. Buhari has murdered democracy and enthroned military regime and people are not speaking out. What a cursed country and coward citizens. Buhari and his military men: DSS, Army, Solders, Police, Navy, Boko haram, Fulani herdsmen, etc. are total disappointment and disgrace. These Fulani people have rubbished and destroyed Nigeria for good. Biafrans – former Eastern region must unite now and exit this zoological republic of Islamic Nigeria before they completely invade your land.